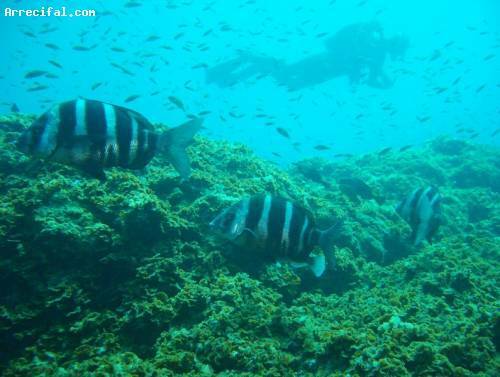 The desert is a dive site located to the northeast of the maritime Restinga Fishing Reserve inside of Mar de Las Calmas. The boat is anchored approximately 200 meter from the shore line. At a depth of 10 meters where there is an abundance of sea weed and rocks you will find large patches of black volcanic sand. To the south there is a barrier parallel to the coast which drops down to 45 meters where caves and crevices can be found. Marine life regularly spotted here are wrasse, a large colony of garden eels, wide-eye flounders, brown lizardfish and stingrays that feed upon fish such as almaco jacks, comb groups and dusky groupers.